He’s arguably the man who has most right to the title “The Fifth Beatle”. George Martin produced, played on, and helped arrange the instrumentation for just about every Beatles LP. His influence on the band cannot be understated. But his talent wasn’t limited to just the greatest band of all time. George Martin was, and is, an amazingly prolific, varied and talented producer – and a new documentary about the totality of his work is on DVD and BluRay shelves now. Called simply “Produced by George Martin” this documentary is a feature-length profile of Britain’s most celebrated record producer. Sir George talks about his childhood, his war experience, and his early days as a music student. The film was originally broadcast in 2011 as part of the BBC’s “Arena” series, but this version contains over 50 minutes of additional interviews not included in the TV broadcast. George Martin really has had a career like no other. In the early ‘50s, he joined EMI/Parlophone and started working on orchestral music, music for children, and pioneered a range of hugely successful comedy records with Peter Sellers, Spike Milligan, Peter Ustinov and many others. Then, in 1962, he signed a band called the Beatles and everything changed. Together, George Martin and the group revolutionised pop music and recording techniques, forging probably the greatest producer/artist collaboration there will ever be. 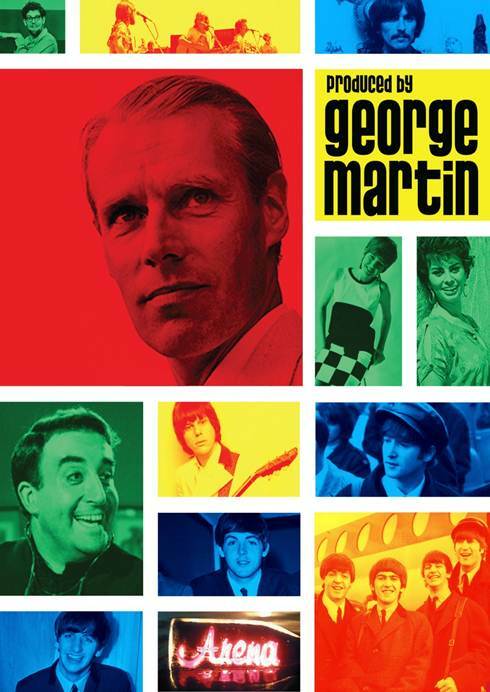 Eagle Rock Entertainment has released “Produced By George Martin” on three configurations: DVD, Blu-ray and Digital Video. We’ll be running a competition. All you’ll have to do is answer a simple question about the great George Martin and you could win. Just check back in a couple of days for details on how to enter. This entry was posted in Beatles, Beatles Collecting, Beatles Music, George Martin, Parlophone Records and tagged Beatles, Beatles Collecting, George Martin, Music, Parlophone Records by beatlesblogger. Bookmark the permalink. I totally agree, George Martin was definitely instrumental to the success of The Beatles. It’s a shame John sort of resented him later on, but hopefully it wasn’t forever. I’ve seen bits of this documentary, but I can’t wait to get it on dvd. I think what strikes me strongly about George Martin, besides his obvious talent as a producer, is how much of a gentleman he has always been. In the years following the Beatles break-up, John Lennon said some pretty harsh things about Sir George, even saying he preferred to work with Phil Spector. John’s remarks undoubtedly hurt Sir George deeply and yet, he has only ever spoken about John with the utmost of love and respect. He wasn’t just the Beatles’ producer, he was also a fellow musician, a mentor, a father-figure, and a friend. This DVD is definitely a must-have for any serious Beatles’ collector or any fan of Sir George, of course! Very insightful thoughts. Thanks for that. Thank you so much! I’ve just been reading through some of your articles and enjoying the experience very much! Well done, sir!